Considered by many to be the most beautiful of the American species, Lilium parryi calls the mountains of Southern California and Arizona home. 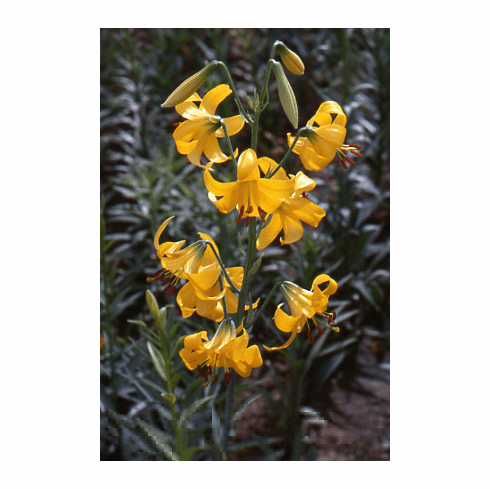 The California 'Lemon Lily' is quite difficult in cultivation. The flowers are yellow in color and lightly spotted in brown. Well drained soil and protection from winter rains is a must to be successful, but in nature, there was a colony about 90 miles from Los Angeles growing in a meadow with numerous springs continually spilling water over the base of the plants with no apparant harm. Used by Jan de Graaff at Oregon Bulb Farm, Lilium parryi was instrumental in the development of the 'San Gabriel Strain'. Inset photo #1 showing a red throat that appeared in a seedling group grown by the late Don Egger. Photo insert #2 is of L. paryii in natural habitat courtesy Wikimedia Commons. Photo taken by Jason Hollinger. Photo used uncropped. This file is licensed under the Creative Commons Attribution 2.0 Generic license. Thank you Jason for sharing this wonderful photo on Wikimedia Commons. Photo insert #3 is of L. paryii in natural habitat in San Gabriel Mountains courtesy Don Davis from CalPhotos. This image has a Creative Commons Attribution-NonCommercial-ShareAlike 3.0 (CC BY-NC-SA 3.0) license. Photo insert #3 shows the difference in the leaves between "L. parryi type and L. paryii var. kessleri found in the San Gabriel Mountains near Los Angeles. The photo of var. kessleri copyrighted Keir Morse, all rights reserved. Source CalPhotos. This image has a Creative Commons Attribution-NonCommercial-ShareAlike 3.0 (CC BY-NC-SA 3.0) license. The photo of L. parryi type copyrighted Thomas Stoughton, all rights reserved. Source CalPhotos. Used with written permission.